University of Cebu President Atty. 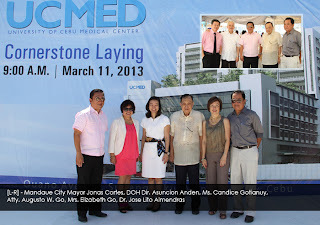 Augusto W. Go and his team sealed the fulfillment of a life-long dream to provide affordable education and medical services with the ceremonial Cornerstone Laying of the University of Cebu Medical Center. With him were UC Chancellor Ms. Candice Gotianuy, Mrs. Elizabeth Go, Dr. Jose Lito Almendras Mandaue City Mayor Jonas Cortes and DOH Dir. Asuncion Anden as they lowered the capsule containing the following symbols: a St. Benedict Medallion, ten peso coin and newspaper of the day, the incorporator’s paper and picture of incorporators with their names, a blueprint of the UCMed, the creed of medical profession, the permit from the Department of Health and a locator’s map of UCMed and Mandaue City. 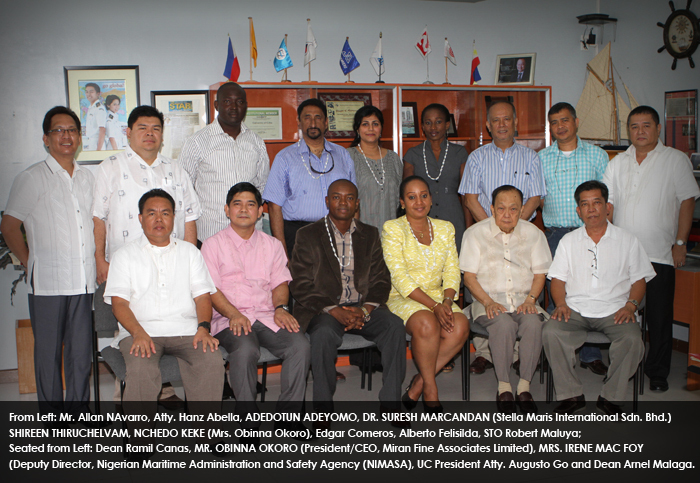 The AWG Group of Companies is sourcing an initial investment of PhP 2 Billion to build the University of Cebu Medical Center (UCMed). It will be the first Level 4 Hospital in Mandaue City, spanning across a 1.3 hectare property located at the North Reclamation Area in Subangdaku. UCMed will be 12 stories high with a 500-bed capacity. Its floor area will be close to 30,000 square meters with a massive entrance lobby, Emergency Room, Radiology Section with X-Ray, MRI and reception, doctors clinics, the Intensive Care Unit, Dialysis Center, operating rooms, admitting area, chapel, conference rooms, wards, private rooms and suite rooms. 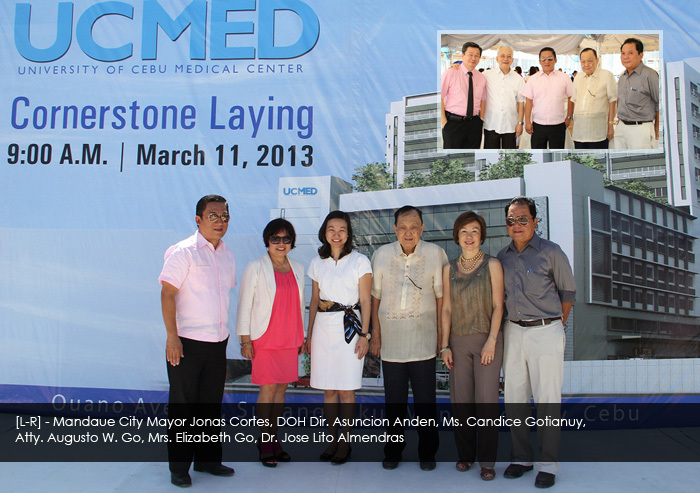 The facility is designed by architectural firm Espina, Perez-Espina & Associates led by Archt. Maxwell Espina. Wally Liu, chief executive officer of Primary Structures will lead the construction of the hospital, which is expected to be fully operational in March 2015. UCMed will serve the general public and the population of all the UC schools and campuses, including the 10,000 plus merchant marine students who will need medical accreditation and attention for foreign ship deployment and the medical and nursing students for their training and employment, plus the rest of the 39,000 students for their medical needs. The UC Medical Center the commitment towards providing quality but affordable education and medical care will be elevated towards greater heights as UCMed will allocate a percentage of its of its services for less privileged members of Cebu at charitable prices.